HTC Legend update fixes Market problems – Desire next? 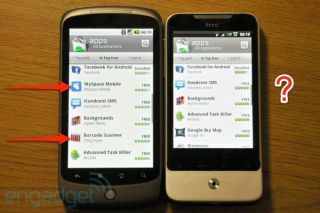 HTC has popped out a little update for European Legend owners, and it's averted a potentially massive app crisis. We've been looking into complaints from a number of readers that they can't get access to certain applications on the Android Market, with most of the issues coming from users of the HTC Desire, HTC Legend and Sony Ericsson Xperia X10. But according to Engadget, HTC has figured out the problem (with the Legend at least) and it's simply 'camera incompatibility'. Things like MySpace and Barcode Scanner were just simply missing for a lot of users, prompting speculation over what this is all about. We've spoken to Google over the issue (which apparently doesn't affect the Nexus One) and it's looking into it – but after this pseudo-admission from HTC it could be more to do with the manufacturers than the search giant. If you're a Legend user, simply sit back and wait – HTC say it will just find the upgrade, but make sure you're in a Wi-Fi area or it will munch on a LOT of data. We'll keep you posted on how this unfolds – but it's not the first time we've seen an issue with Android Market, is it?